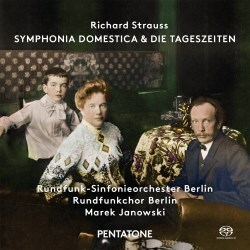 Symphonia Domestica has four movements: Introduction, Scherzo, Cradle Song and Adagio and Finale but in truth it is a large tone-poem that depicts the everyday life of the Strauss family. It can’t really sustain its claim to be a symphony. The work can be enjoyed as pure music without knowing all the finer details. That said, it would have been helpful had Pentatone at least given the listener a few pointers in their booklet such as the themes used to portray each family member — the father, mother and child — and also a brief overview of what is going on in each of the four sections. The programme is easy enough to follow. The family members are introduced and we are presented with a number of scenes that include the baby at bath time, a cradle song, the parents’ happiness and the clock striking 7.00pm. The Adagio includes the infamous but very beautiful love scene and this movement comes to an end with the clock striking 7.00am. After the awakening the finale starts with a huge row which eventually leads to a happy conclusion for the family. The work utilises a massive orchestra but the full forces are rarely unleashed and it certainly can’t be described as a noisy score. It’s only noisy in the hands of a bad conductor. Indeed, much of the beauty of the work is to be found in the substantial sections of intimate, delicate music of chamber-like proportions. Janowski’s new recording is blessed with some fine orchestral playing and a recording offering clarity of texture and power in the climaxes. It doesn’t have the thick, lush orchestral string tone of Karajan’s Berlin Philharmonic recording on EMI Classics, which still sounds sensational. I do, however, prefer the clean articulation and detailed execution in the new recording. This is an example of modern digital production outshining what is still a good analogue version. The strings are full-toned and the horns in particular are on superb form for Janowski. Karajan is full fat Strauss, Janowski is more semi-skimmed but that isn’t criticism, merely a comment on the different orchestral sounds produced by the two Berlin-based orchestras. Although I wouldn’t be without Karajan or Kempe (also on EMI Classics) this new recording, offering superlative playing is a fine achievement and can be warmly welcomed. For those coming to the work for the first time I would favour the Janowski. He paces everything perfectly and at no time does he go for the sort of garish, sensational extremes that can make this work sound too bombastic and tasteless for some listeners. The climaxes are still tremendous but he offers plenty of sophistication along the way. The chamber music sections are beautifully realised. The coupling is rather unusual. Die Tageszeiten (Times of Day) was written for male chorus and orchestra in 1928. It is a setting of texts by Eichendorff and is a delight. I had never heard of the piece before and its inclusion here makes the CD an outright winner. The four movements are Der Morgen (morning), Mittagsruh (afternoon rest), Der Abend (evening) and Die Nacht (night). Richard Strauss takes some beating when it comes to setting words to music and the warm, rich glow of orchestral colours we hear in this rare work could only have come from his pen. The music is reminiscent of the Four Last Songs and the performance given by the gentlemen of the Rundfunkchor Berlin is stunning with a terrific range of dynamics, flexible phrasing and pure intonation. In summary Pentatone deserves great success with this issue. Sinfonia Domestica may be the main work on the disc but as fine as that is the coupling shouldn’t be missed.